So, the October theme of "Sensual" posed its challenges, didn't it? On November let's turn up the volume with "Rock'n'Roll." 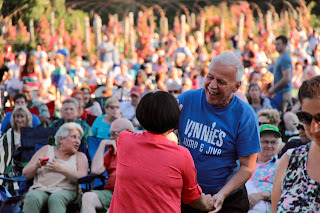 Those who look at Jack's Blog -- Naples and Hartford in Season -- recognize that (a) when he is in Connecticut he often visits the gorgeous nearby gardens in Elizabeth Park, and (b) on Wednesday evenings in the summer he often photographs the dancers at one of Elizabeth Park's free concerts near the rose garden. Here is one happy couple rocking up a storm. How will you portray "Rock'n'Roll" on November 1? Love the creative energy of this theme. Peter, How can I fix my post so my photo shows? Oops. I posted twice. Could my first effort be deleted?? It links to the overall blog. (The most recent post is linked to CDP Theme day posting.) Thanks. I remember when rock was pretty new. Some people said it was a fad! @Kate - I'm so sorry I've just located your comment! All fixed now albeit rather late!